Snow Cream Dessert- A Healthy Dessert that is thinner than ice cream, creamier than sorbet, and smoother than snow cone with 60-80% less sugars and calories. Wings- 6 pcs with your choice of spicy/spicy or Spicy/BBQ. 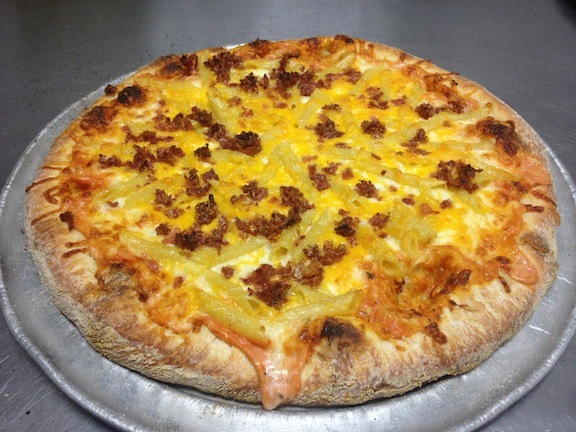 Our Gourmet Specialty Pizzas can only be found at 8 Buck Pizza Plus and they are the rave of the our customers. Chicken Bacon Ranch- this is grilled chicken on our own home made ranch dressing and Bacon... is a hearty meat option and since its on ranch it gives you a fourth alternative on Sauce. Penne Pasta,Cheddar Cheese,and Bacon, over our "Pink Sauce" Adults and Kids love this choice. Seasoned Beef,Cheddar Cheese, Bacon with our BBQ sauce Drizzled over the top. smooth, cruncy and tasty in each bite. Grilled Chicken, Spinach and bacon over our Garlic White Sauce. Simple but Elegant. Our Awesome Veggie pizza using Daiya Cheese, Spinach, and artichoke hearts. There are no animal products or by products in this choice... Our vegan friends can now enjoy a pizza.